Objective This article describes the sonoelastographic features of the patellar ligament of sound dogs and tests feasibility, reproducibility and repeatability. Methods Clinically healthy medium-to-large breed dogs were enrolled. Sonoelastographic images of the patellar ligaments were obtained in lateral recumbency with the stifle flexed by an experienced operator and by a senior veterinary student. The elasticity colour map included red (soft), green (intermediate) and blue (hard). Tissue elasticity was measured by calculating the percentage of softness with dedicated software. Categorical, qualitative data analysis was performed using a weighted kappa statistic for repeatability and reproducibility. A categorical qualitative assessment was performed based on a grading scale of 1 to 5 (soft, mostly soft, intermediate, mostly hard and hard). Results Fourteen clinically normal dogs were considered. A total of 28 patellar ligaments were examined. Overall, 25 of the patellar ligaments were graded as soft or mostly soft and the remaining 3 as intermediate. Repeatability was 86.2%, with a weighted kappa of 0.64 (good), for the well-trained sonographer and 83.3%, with a weighted kappa of 0.53 (moderate), for the senior student. Reproducibility was 86.2%, with a weighed kappa of 0.65 (good). 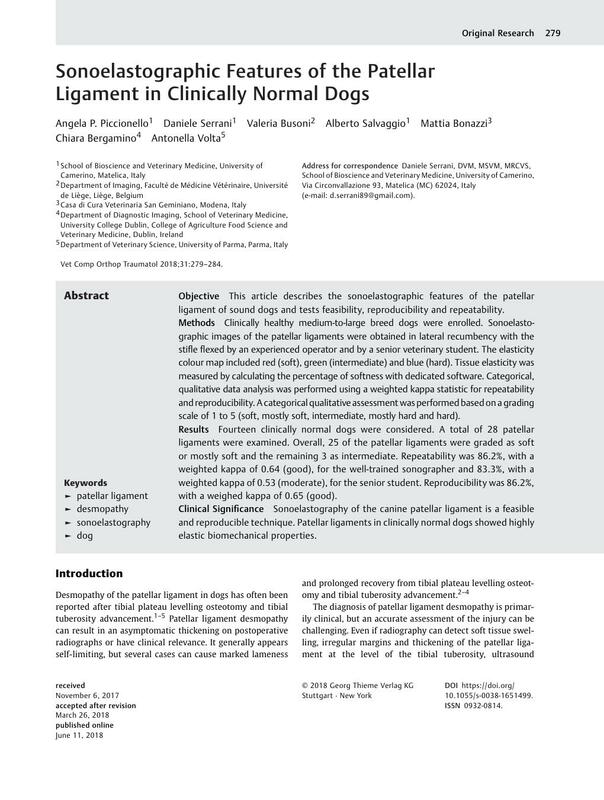 Clinical Significance Sonoelastography of the canine patellar ligament is a feasible and reproducible technique. Patellar ligaments in clinically normal dogs showed highly elastic biomechanical properties.